MLA George Rogers (second from left) and Leduc County Mayor Jon Whaley (far right) presented two cheques for the New Sarepta Agriplex expansion. 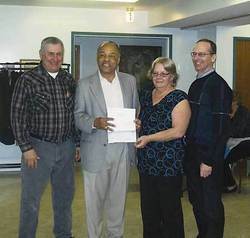 Dawn Davidson (second from right) accepted a cheque for $70,350.00 from the Agricultural and Rural Development Initiatives Program on behalf of the New Sarepta Agricultural Society, and Nelvin Ansorger (far left) accepted a cheque for $100,000.00 from the Community Facility Enhancement Program on behalf of the New Sarepta Golden Pioneers. Photo graciously submitted.